The Irish climate is notoriously unreliable and unpredictable. Unfortunately we cannot promise good weather for the wedding day! One positive is that at least the weather in Ireland does not suffer from extremes of heat, cold or intense rain. The average daily high for Ireland at the end of May is 16C (61F) and the average low is 8C (47F). A high above 25C (75F) is very unlikely. On the other hand, some overnight frost is not out of the question. The Irish climate is renowned for being cloudy and rainy, and this is unfortunately true: on average there are 5 hours of sunshine per day in May, and some rain can be expected on about one half of all days. On the other hand, May is one of the driest months in Ireland and rain usually falls in the form of showers so it rarely rains all day! Another positive is that the days are long by the end of May: sunrise will be at about 5:30am and sunset will not be until 9:45pm. Our advice for the wedding day is to hope for a pleasant and sunny day but to come prepared for cool weather in the evening and to bring an umbrella in case it rains! Met Eireann is the national weather service for Ireland. Its website has a daily forecast and more information on the Irish climate. 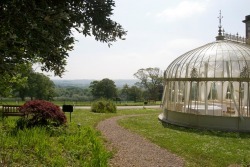 Longueville House conservatory in May 2010, demonstrating that there could be good weather for the wedding day. If it does rain then it's still a beautiful country! 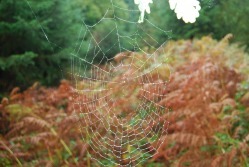 Spider web in the rain, Comeragh Mountains, Co. Waterford.